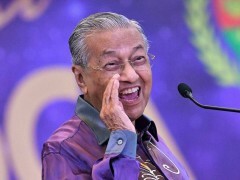 KUALA LUMPUR — Prime Minister Dr Mahathir Mohamad and his government’s approval ratings remain largely the same, with no tangible change in public satisfaction, an International Islamic University Malaysia (IIUM) survey has found. The findings are in contrast to a recent statement by PKR's Rafizi Ramli that Dr Mahathir’s popularity has sharply declined in recent months. The IIUM survey, conducted nationwide this month by Professor Syed Arabi Idid and his assistant, Azrul Hisyam Wakichan, of the varsity’s Electoral Studies Unit, showed that the prime minister continues to command the public’s respect. In both August and this month, 62 per cent of respondents expressed satisfaction with Dr Mahathir’s performance, reported Bernama. The survey, a continuation of a study on national and current issues first conducted in August, also found that Malaysians’ satisfaction with the performance of other leaders, namely Deputy Prime Minister Dr Wan Azizah Wan Ismail, PAS president Abdul Hadi Awang and former prime minister Najib Razak, remained mostly the same as the August outcome, varying by just 1 per cent. On December 19, Mr Rafizi said Dr Mahathir’s approval rating dipped from 72 per cent in June to 53 per cent earlier this month. The prime minister dismissed Mr Rafizi’s remarks, citing the latter’s off-target predictions for the 14th general election. The former Pandan MP had predicted that PAS would not win a single seat, but on May 9, the Islamist party won 18 parliamentary and 90 state seats. The IIUM survey showed that only DAP secretary-general and Finance Minister Lim Guan Eng recorded a notable increase in rating, from 36 per cent to 45 per cent. Of the respondents, 55 per cent said they will vote for Pakatan Harapan and its ally, Parti Warisan Sabah, while 24 per cent said they support BN. Those who pledged loyalty to PAS comprised just 16 per cent. In the August study, 56 per cent of respondents said they will vote PH, BN (24 per cent) and PAS (14 per cent). The survey found that the most support for PH comes from the Chinese community at 73 per cent, followed by Indians (56 per cent), and Malays and Bumiputeras (42 per cent) – about same percentages recorded in August.